Choosing the best tandem fishing kayak can be a frustrating task. It is hard enough choosing a one person boat How can you begin to think about selecting a boat for two! There are so many considerations – size, weight, material, and features are just a few considerations for example. Then you have to look at the accessories and gear too! It can be a complete minefield! Luckily we understand your dilemma. 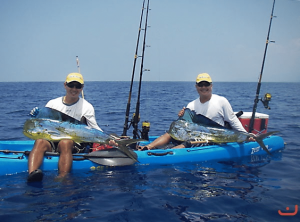 We know just how difficult selecting the best tandem fishing kayak is. We also have in-depth knowledge and can lend a hand! We know what constitutes a quality tandem kayak and understand aspects such as materials, sizes, and gear. We can help choose the best boat for your tandem adventures. If you continue to read on, we will share our wisdom and help you make the right choice. 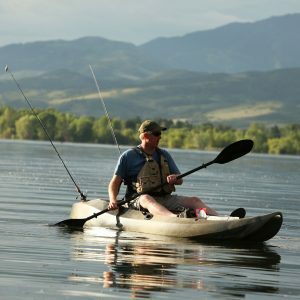 What is a good tandem fishing kayak? Kayak fishing is one of the most exciting past-times you can find and fishing is a great sport. When you add a boat to the mix, things get interesting! Imagine paddling down a secluded river, trees and greenery passing by with the sun is beaming down on your head. You see movement and pull up to bag yourself a huge catch! Kayak fishing gives you freedom, variety, and excitement. What could be better than sharing this experience with a friend or family member? This is why tandem boats are increasingly popular. By purchasing a two person kayak, you can bring a friend along on your adventure. Moreover, you can share the workload and take turns paddling Some people would simply buy two single kayaks but why do that when you can save expenses and purchase the top tandem kayaks instead? 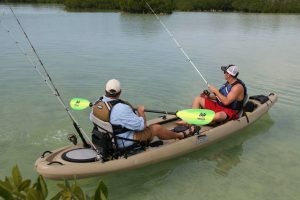 What key features should the best tandem kayak for fishing have? 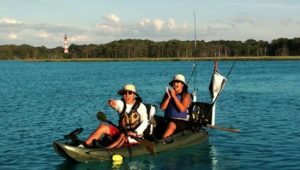 What is the best tandem kayak for fishing? First, there are many boat designs available when buying a double kayak. For example, we have sit-on-top, sit-in, recreational, touring, folding, inflatable, and rigged. With a tandem kayak for fishing, you are more limited in choice. Some outriggers simply aren’t suitable for two people. For example, a foldable outrigger would not provide enough support and stability for two people. Suitable double Kayaks include recreational, rigged, touring, and sit-in. Recreational double kayaks are suitable if you and your friend are just spending a few hours on a lake for example. This outrigger is cheap and less durable. If you do want to travel longer distances, you and your friend could consider a day touring or touring double Kayak. These are made from more durable materials and have additional storage room. A sit-in duo boat is also preferable for two. Can you imagine how unstable a sit-on-top outrigger would be with two people? If the outrigger becomes unbalanced, you could potentially put both people at risk. This is why a sit-in duo boat is a better choice. By lowering yourself into the duo boat; you give yourself and your friend greater balance and stability. Sit-in tandem kayaks also generally have two separate seats giving extra comfort for longer journeys. What material is a tandem kayak made of? Durability – Do you use your duo boat frequently? Will you take it out on open water? Will it be continually barraged by the elements? If so, choose a durable material such as ABS plastic or fiberglass composite. Alternatively, if you only use it a few times a year on calm waters, polyethylene plastic could be a better choice. Weight – Does your duo boat need to support two well-built people? What is the maximum weight it needs to support? Will you carry the boat long distances? Will it need transportation using a truck or trailer? Composite materials offer the lightest weight. This material is suitable if your boat will regularly be transported and carried. Cost – What budget do you have to work with? Do you want a cheap and cheerful boat? Do you want to shell out mega bucks and pay for only the best? Any plastic material is cheaper for a two person fishing kayak with polyethylene generally the cheapest. This is cheaper but forgoes durability and UV resistance. Composite materials, on the other hand, have fantastic resistance. Furthermore, composites are extremely lightweight. As you would expect, you must pay a premium for this. What is the best gear for kayak fishing? Finally, look at the best tandem kayak gear. You cannot simply buy a tandem fishing kayak without accompanying gear. You will need a pair of paddles, a spray skirt, and two PFDs as a minimum. When purchasing paddles, you can either buy a single or dual configuration. With two people, a single-side paddle could be suitable as you share the workload and may not benefit from two dual side paddles. A spray skirt should cover the 2 man fishing kayak enclosure. In most cases, you will purchase a single spray skirt that has two holes. You cannot usually buy two separate spray skirts for a tandem vessel – this could compromise the protective barrier and potentially let water in. Personal flotation devices revolves around personal choice. Both occupants of the tandem boat must have a PFD for safety. A full life jacket with padding and inflation is preferable. This ensures if that one occupant experiences trouble, the other can stay afloat and help him or her. 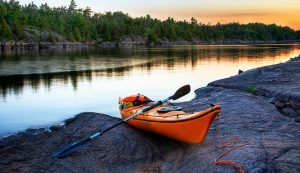 Whether you’re looking for a large boat for you and your best fishing buddy, or a versatile boat capable of going out solo or with your family, there’s undoubtedly a great kayak out there for you. Here’s our list of the top-ten best tandem kayaks on the market today. 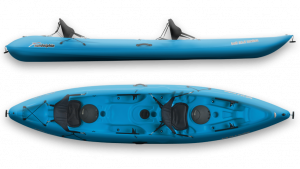 Lifetime’s 10-footer features an innovative design for a double person kayak. 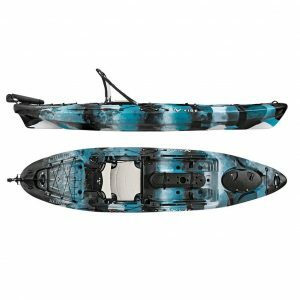 This boat is short for a tandem, but its wide footprint and open deck layout makes it the best tandem fishing kayak on our list. Lifetime makes a variety of kayaks and other outdoor, molded plastic gear. Whether you need a picnic table or a paddleboard, Lifetime’s got you covered. If you’re looking for a small, easily transportable vessel that can handle one, two, or even three paddlers, look no further. With an impressive 500-pound capacity and an easy to carry 10-foot, 60-pound hull, it’s hard to beat this Lifetime tandem. It’s really not much to look at, but the versatility makes this 10-footer an excellent choice for a tandem kayak. With a really deep cockpit and large padded seats, BKC’s 12.9’ double seater kayak looks comfortable. There’s a tremendous amount of storage and space on the boat, and BKC says it can easily hold two adults plus a child. Brooklyn Kayak Company makes some attractive and functional kayaks and paddleboards. Their company is all about selling kayaks that are entirely outfitted and ready to enjoy the water. If you have a little more storage space and the ability to transport this 77-pound boat, you won’t be disappointed in its performance. It has enough capacity to enjoy a weekend camping and fishing trip, and it looks pretty good while doing it. 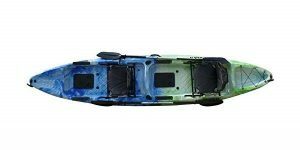 BKC’s kayak offerings are sharp looking designs that might just be the best tandem fishing kayak for you and your fishing buddy. A few inches short and a bit sleeker than the UH-TK122, this 12’5” double fishing kayak doesn’t offer nearly as much storage space, but it’s easier to transport and a better performer on the water. BKC’s designs range from inflatables to beefy tandems. They have several versions of tandems, ranging in size from 12 to 14 feet. Due to its narrower beam and more streamlined hull shape, this boat’s capacity is a lot less than the UH-TK122. What you get in exchange is a boat that is more fun to paddle and easier to transport. If you ever paddle solo, this boat will be a lot easier to control than its big brother. If you’re looking for the best double kayak that’s as fun to paddle with your significant other as it is to paddle solo for fishing trips, this BKC should be on your list. 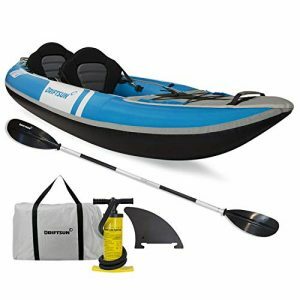 A 2 person inflatable kayak is an excellent choice if you have trouble storing or transporting a plastic boat. These vessels are blown up in about five minutes with a hand pump, and they store in their own backpack. Driftsun makes a selection of inflatable and hard kayaks, including a fun transparent kayak. They also manufacture paddleboards, ice chests, and other water toys. You can’t beat the versatility of a boat like this. You can take this boat literally anywhere, even as checked baggage on an airline flight. While it doesn’t come set up for fishing, outfitting would be easy, and the boat could be paddled with one or two people. If you have to drive to the water and you have a small car, inflatables are the best double kayak option for you. Vibe Kayak’s flagship Sea Ghost 130 is a serious fishing machine. It’s a sleek looking 13-footer with plenty of storage. 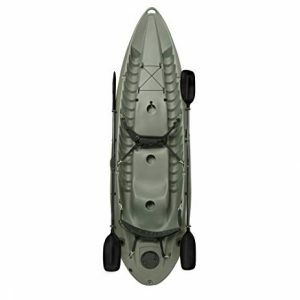 This model is not a 2 person fishing kayak, but rather a huge single with an impressive load capacity. If you’re looking for a boat with plenty of room to take your dog and maybe a small kid with you, this is it. Vibe makes a complete line of really nice sit-on-top kayaks. They also make a range of ice chests. 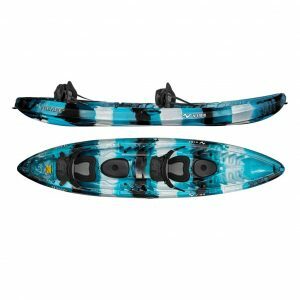 Vibe’s Sea Ghost 130 is one of our favorite kayaks and worth mentioning since it has a great layout and plenty of space. The boat paddles well and makes for a great day on the water with friends. The Sea Ghost 130 is a great boat. 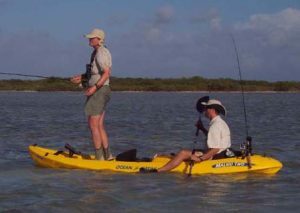 If you are a couple looking to paddle together or if you are looking for a boat to take out with your buddies, you’ll need to find a true tandem fishing kayak. The Sea Ghost is big enough to handle the paddler plus a small passenger, so if most of the time you are heading out alone and only occasionally take a guest, the Sea Ghost might work for you. Vibe’s largest tandem is the Yellowfin 130T. 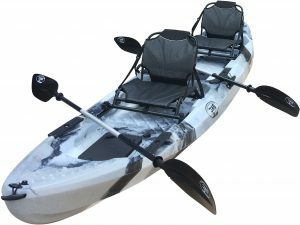 This is the most stable fishing kayak for two people around. It’s got a super wide stance to reduce tippiness, and it has perfect weight distribution. Its wide with open decks and side-mounted foot braces leave lots of space available for coolers and fishing gear. Vibe is a Georgia-based company that hopes to inspire people to spend more time outdoors since they believe that “being in nature makes you a better person.” Their kayaks come ready to go, and their famed Vibe Hero Seats are some of the most comfortable out there. 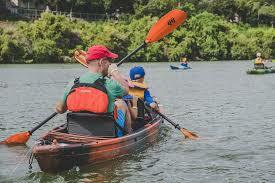 The Yellowfin 130T is a perfect kayak for families with one child, or for couples with a pet who likes the water. There’s plenty of space and capacity. It’s fishing options are, however, limited without investing in a few more accessories. Even though it might require buying a few more rod holders or mounting some gear tracks, the Yellowfin 130T is the best fishing kayak on our list because of the center seat location. This makes the boat pleasant to paddle solo as it is with your fishing partner. 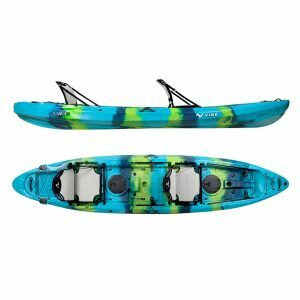 Vibe’s other 2 person fishing kayak is the Skipjack 120T. This boat is a foot shorter, a few inches narrower, and a few pounds lighter. It carries about the same load, it just has a little less space on the deck for gear. Like their Sea Ghost performance boat and their Yellowfin tandem, Vibe’s Skipjack maintains the company’s tradition of making beautiful boats that come with a lot of gear. Also like the Yellowfin, the Skipjack 120T’s fishing gear is limited to a couple basic rod holders. 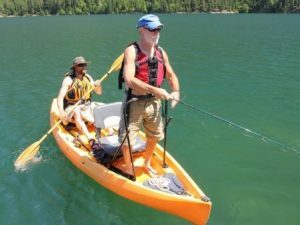 It’s a wonderfully versatile boat and it represents a fantastic value for kayak anglers looking for a tandem they can outfit just the way they want. Vibe’s Skipjack 120T is a real winner. It can make a good fishing kayak that’s short enough to be easily transportable and still carry an impressive load. Plus, it has a fine hull shape to slice through chop and track straight. Sundolphin’s Bali 13.5 Tandem is an attractive, deep-cockpit boat that could make a great fishing platform. Anglers will have to spend a little more since this boat doesn’t even have rod holders or paddles. Sundolphin makes the best tandem kayak for paddlers on a budget. Their boats are significantly cheaper than other brands, but still retain features that make them great for fishing. The Bali is the most stable tandem kayak in the Sundolphin lineup, and it has plenty of space for add-on toys. Like Vibe’s tandem boats, the Sundolphin is a great boat that can accommodate one, two, or even three people. It has plenty of room to expand its gear and get ready for fishing. However, for the money, we’d instead get a fully outfitted boat that is ready to go. Another two person fishing kayak from Brooklyn Kayak Company, the UH-TK29 is no doubt their best tandem fishing kayak. This boat is a wide and stable platform that comes loaded with a lot of great gear. BKC’s stated goal of selling ready-to-play boats is certainly met with the UH-TK29. This vessel is ready to go catch some fish, just take your pole! The only problem we can see with the UH-TK29 is its lack of a center position for solo trips. If you always fish with a buddy, this boat should make your short list. Built for serious fishing with a friend, BKC’s UH-TK29 is an excellent kayak for the job. Epic Gear’s NEXT Tracker II is a nicely implemented tandem kayak with all the right features. Epic Gear mostly makes accessories for kayakers, surfers, SUPers, and kiters. They make beautiful paddles, along with leashes and beach carts. The NEXT Tracker II comes with all the right features. It’s ready to go fishing, and if you like stand-up casting, you’ll love its open deck space and the flat hatches found on this boat. At 95 pounds, the NEXT Tracker II is a beefy 13-footer. 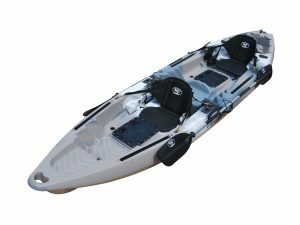 But anglers will love its layout, and the boat is sure to become a top rated kayak. There’s a lot to consider when picking out a tandem kayak, and anglers have even more options to weigh. Here are the answers to your top questions about your two-person kayak. How much do kayaks weigh? The weight of a kayak depends mostly on the size, length, and width, and on the materials used to make it. The lightest kayaks are inflatables, which can weigh less than 20 pounds. Tandem kayaks usually weigh more than singles since they are designed to carry a more significant load. Plastic kayaks weigh the most, but they are also the least expensive and the most rugged. What does tandem kayak mean? A tandem kayak is designed to carry two paddlers. These two-person kayaks have separate seats and enough storage to bring gear. While shorter tandems are available, if the paddlers are too close together they will have to synchronize their paddle strokes to keep from bumping paddles. How long is a tandem kayak? Different designs have different lengths, but in general tandem kayaks are between 12 and 15 feet long. This is slightly longer than comparable singles since tandem boats must hold more weight. Can you ride a tandem kayak alone? Some tandem boats are also designed to be paddled by one person. The best ones have an adjustable back seat so that the seat can be placed in the middle of the boat and the load balanced. If your tandem has molded seats, you can paddle from the rear seat alone, but it will be tough to control and will be heavy at the stern. When paddling a tandem kayak solo, some kayakers place a cinder block or a bag of cement in the front seat to give balance. How much weight can a tandem kayak hold? Most tandem kayak designs can hold 400 pounds or more. In the end, it depends on the length, width, and hull design. Do you need a lifejacket on a kayak? Yes, all vessels are required by federal and state laws to have Coast Guard approved PFDs, or lifejackets, on board and quickly accessible. Depending on the paddling you do and your comfort in the water, you might want to consider a comfortable lifejacket you can always wear. For this purpose, inflatable PFDs are popular. 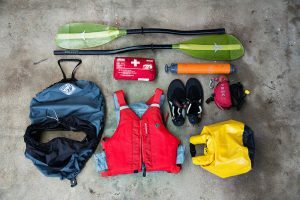 If you’re going to hop on and off and go swimming, some may find a traditional Type II lifejacket stowed on the deck and within reach a better option. What is the best tandem fishing kayak on the market? For our money, the Lifetime 10 Foot, Two Person Tandem Fishing Kayak with Paddles is the best tandem fishing kayak. Other great options include the Vibe Kayaks Skipjack 120T for those on a tighter budget looking for a lot of versatility and the Vibe Kayaks Yellowfin 130T 13 – Foot Tandem Sit On Top Kayak for those looking for the most stable platform for two paddlers.